Feeling eye fatigue? Even if you’re not over 50 you may feel like you need reading glasses? We can help! Many people are feeling eye fatigue at younger ages. This could be due to the amount of time we spend with more items closer to our eyes. Now so much can be done on tablets and smart phones, our close-up screen time is increasing. As a result, we have several options at our offices to help different patients with their needs. Some signs you may need bifocals, reading glasses, or progressives – you cannot read up close without stretching your arm further and further. Feeling headaches or tired eyes, you may need a computer or anti-fatigue lens. There are so many options of solutions that we wanted to look at each one specifically. Readers are a single vision lens that helps patients read things close up. There are two main styles. Full frames – Full frames are a single vision lens fit to meet your prescription as a reader. What does that mean? Well, if you have an astigmatism we will need to adjust your single vision reading prescription so that you can clearly see. That means that purchasing a reader from a drug store may be robbing you of your best vision. Half eyes – these are smaller frames. Some would describe them as “Benjamin Franklin”glasses. They sit low on your nose. 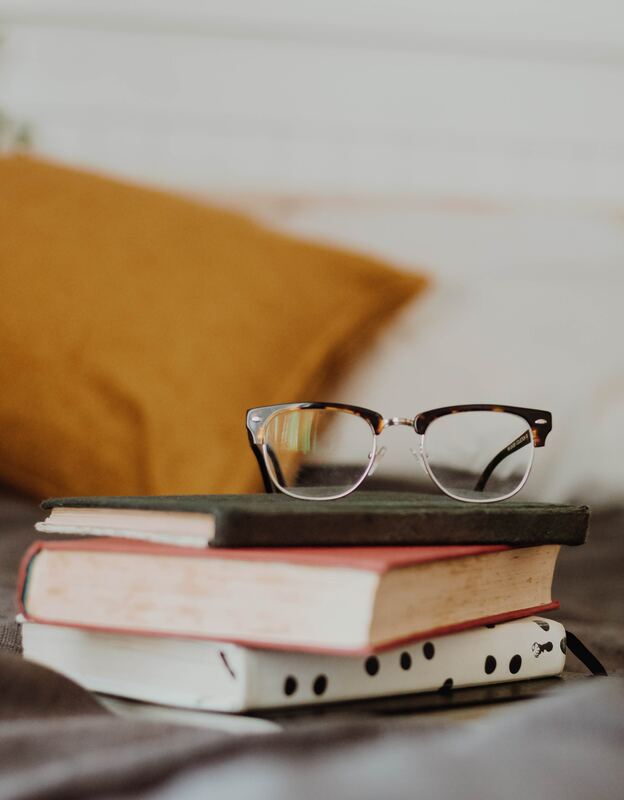 Patients that would benefit from lined bifocals or trifocals over readers are patients that have a distance prescription but also feel they need a reader. As the lens technology has changed, many patients are looking for progressive (no line bifocals) instead of lined bifocals. The benefits to a lined bifocal are that they provide a wider lens area for reading than a progressive. 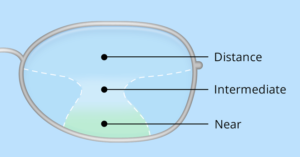 Progressive lenses are similar to lined bifocals/trifocals but they do not have lines. In addition, they have an area of the lens that has no vision correction. This can lead to a “fish bowl” affect. This should subside within a month, but can be quicker based on the patient. We recommend you put progressives on first thing in the morning, as the brain processes visual information the moment you wake up. Next, turn on the TV and hold a book. Look up at the TV until it is clear. Look down at the book until it is clear. Then continue this until it seems natural. Then add something center room (like a lamp). Add this into the different areas you are looking at. This will help develop muscle memory and allow your eyes to naturally look through the portion of the lens providing the correction you need. As mentioned earlier, in today’s world there is increasing hours spent on devices that are close to our face. This is causing our eyes to lose practice and decreasing our muscle movement within our eyes tiring them more easily. This can cause blurred vision, headaches, and even migraines. As a result, many lens companies have developed an anti-fatigue lens. This offers a type of non-lined bifocal at a lower power and lower price point then progressives. These lenses allow for patients to have relief by adding a slight addition (usually between +0.50 and +1.25) to the bottom of their lens. To find out if your specific needs would be better in an anti-fatigue lens, contact our offices now for an appointment with one of our optometrists! A computer lens is similar to a progressive but without distance. These computers, or office space, lenses are idea for someone working in an office. There are three levels in which the patient can choose from depending on needs. Your optician may ask you if you want to just see your computer and keyboard, your computer and desk, or your computer, desk, and someone standing at the edge of your desk. This will help fit the patient in the correct distance office space lens for their needs. There are so many more technologies we can discuss in assisting your needs. One option we always suggest is blue anti-reflective coating. This coating creates a filter that blocks the harmful light coming from computers, tablets, and phones. To learn more and to find the perfect pair of glasses for your needs contact us today to schedule an appointment!